Miss Freda Joan Ferris, daughter of Mr. And Mrs. A.E. Ferris of 28 Egerton Gardens, West Ealing, was married on Saturday at St. Stephen’s Church, West Ealing, to Corpl. Frederick Arthur Tickner, R.E., the son of Mr. F. A. Tickner, of 26 The Crossways, Hounslow, and of the late Mrs. Tickner. The bride is a clerk in the office of the Clerk to the Ealing Magistrates, and is well known for her work in connection with the Juvenile Court. She has taken a prominent part in the social activities at St. Stephen’s and has played several leading roles in dramatic productions by the St. Stephen’s and St. Luke’s Players. She was educated at the Ealing County School for Girls. 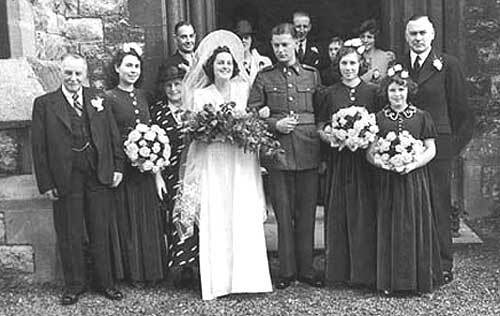 The bridegroom, who is now serving with the Royal Engineers was until the beginning of the war an assistant clerk to the Ealing Justices. He is a native of Brentford, and began his career in the office of the Brentford Police Court. A keen member of the Territorial Army for some months before the outbreak of war, he was mobilised in September of last year. The bride, who was given away by her father, wore a gown of figured taffeta, with a high halo of stiff silk lace with an embroidered train; her only ornament was a string of pearls, and her bouquet was of deep red roses. The bridesmaids were her nieces, Miss Mary and Miss Margaret Warren, and Miss Madeleine Shakespeare. They wore blue velvet dresses cut in Victorian style, with silver shoes and head-dresses of cream roses, and carried posies of the same flowers; each wore a gold cross and chain, the gift of the bridegroom. The bride’s mother wore a black and white two-piece of figured crepe-de-chine with hat to tone. The best man was Mr. A. J. Schofield. The service, which was choral, was conducted by the Rev. T Hyslop, with Mr. Hadden as organist. The choir sang the hymns , “Lead us, Heavenly Father” and “O Perfect Love”. A reception was held at the Walpole Hall, Bond Street, Ealing. The honeymoon is being spent in Stratford-on-Avon. 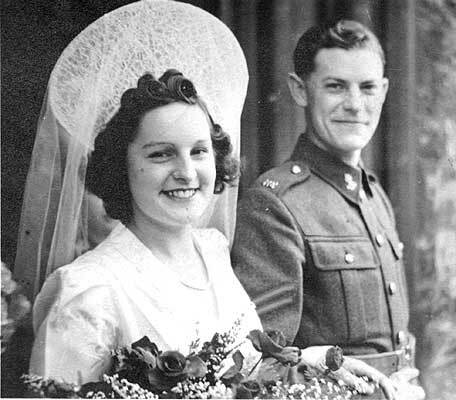 Mr. and Mrs. Tickner will make their home at 28 Egerton Gardens, West Ealing, for the duration of the war. They were presented with a handsome canteen of cutlery by their colleagues.